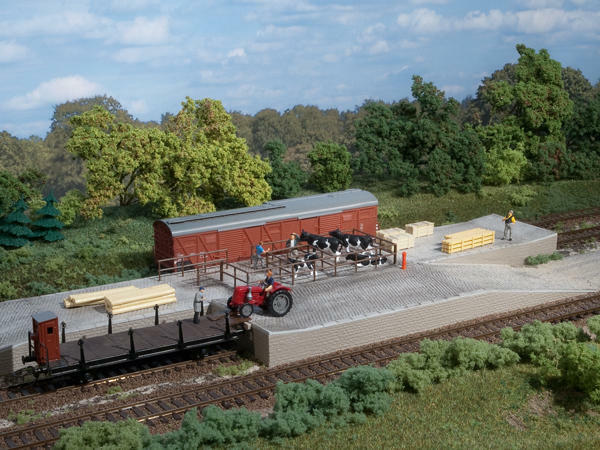 Offers endless opportunities for loading freight of any kind on any layout! 3 rectangular ramps 119 x 70 x 18 mm 1 railcar loading ramp 70 x 26 mm and 2 drive-up ramps 119 x 70 mm with a cobblestone surface. Also includes steel pens water hydrant for washing down the dock and appropriate signs. For all H0 track systems. When using track with built-in trackbed compensate for the extra height with the base.